What’s holding up production? I need one of these right now! And why can’t regular car companies do this? Being stalked? Just go ahead and camouflage yourself as a Coke machine. Martin Fackler’s NYTimes article Fearing Crime, Japanese Wear the Hiding Place gives us a look at the peculiar world of Japanese innovation. [Japan is] home to a prolific subculture of individual inventors, whose ideas range from practical to bizarre. Inventors say a tradition of tinkering and building has made Japan welcoming to experimental ideas, no matter how eccentric. “Japanese society won’t just laugh, so inventors are not afraid to try new things,” said Takumi Hirai, chairman of Japan’s largest association of individual inventors, the 10,000-member Hatsumeigakkai. 1. A Chindogu cannot be for real use. 2. A Chindogu must exist. 3. Inherent in every Chindogu is the spirit of anarchy. 4. Chindogu are tools for everyday life. 5. Chindogu are not for sale. 6. Humor must not be the sole reason for creating Chindogu. 7. Chindogu are not propaganda. 8. Chindogu are never taboo. 9. Chindogu cannot be patented. 10. Chindogu are without prejudice. And here are a few examples of chindogu from the King of Chindogu – Kenji Kawakami. Why do so many global strategies fail—despite companies’ powerful brands and other border-crossing advantages? Seduced by market size, the illusion of a borderless, “flat” world, and the allure of similarities, firms launch one-size-fits-all strategies. But cross-border differences are larger than we often assume, explains Pankaj Ghemawat in his new book: Redefining Global Strategy . Most economic activity—including direct investment, tourism, and communication—happens locally, not internationally. Give yourself—or your colleagues—1 point for each yes answer, and add them up to get to the total score. Zero implies an absence of globaloney. A score of 1 or 2, while indicating some globaloney, is still better than average. A score of 3 puts you at the average for several hundred managers who responded to an online survey—see below—but note that the average is pretty unhealthy given the number of problems it can lead to (think Coke). And a score of 4 or 5 rises beyond globaloney to the level of globalmania. 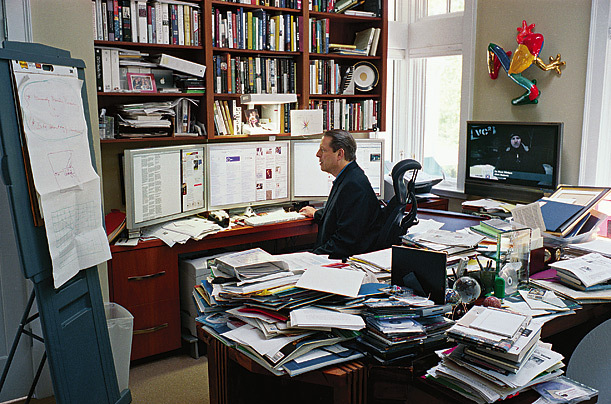 This is not a politician’s desk… Now will he take on Exxon and their paid goons? While Gore is unexpectedly leaving the country to pick up his Nobel Prize, DraftGore.com has turned up the volume with an ad in the NYTimes (see full text below – I’ve added a few hyperlinks and a video or two to add context). Today we respectfully ask that you honor that pledge and hear us now. You say you have fallen out of love with politics, and you have every reason to feel that way. But we know you have not fallen out of love with your country. And your country needs you now — as do your party and the planet you are fighting so hard to save. You often quote Winston Churchill to remind us that we are entering a period of consequences with regard to the global climate crisis. You have done a superhuman job of bringing world attention to this issue. But this effort needs to be raised to a higher level. Only from the Oval Office can you wield the kind of influence needed to move countries, policies and corporations to bring about meaningful change. The period of consequences you talk about is upon us in many other equally critical areas as well. Our Constitution is being trampled and our most cherished civil liberties are in grave danger. The executive branch is not accountable to anyone. And the people most in need of a voice in this country need someone in the White House who will speak for them. Thousands of Americans are dying needlessly in Iraq while our reputation in the world has plummeted to an all-time low. The war on terror is backfiring as our enemies grow stronger and our resources are drained in an endless and unwinnable war. This is one of the most serious foreign policy crises our country has ever faced. You were the first American political figure to brave political waters and warn us of the perils of starting a preemptive war in Iraq. You were right. But time to reverse the damage is running out. Given your experience, insight and the respect you enjoy among world leaders, you are uniquely positioned to bring this war to an end and restore America’s good name. As you so often say, Mr. Vice President, these are not political issues. They are moral issues. That’s why more than 136,000 people have signed our petition asking you to run for president in 2008. Ours is an urgent call to service on behalf of the country we love, the democracy that’s slipping away from us, and a world and planet that are in peril. We write on behalf of our children and grandchildren and plead with you to to lead us to a brighter future. Many good and caring candidates are contending for the Democratic nomination. But none of them has the combination of experience, vision, standing in the world, and political courage that you would bring to the job. Nor do they have the support among voters that you enjoy and that would lead you to victory in 2008. Mr. Vice President, there are times for politicians and times for heroes. America and the Earth need a hero right now — someone who will transcend politics as usual and bring real hope to our country and to the world. Please rise to this challenge, or you and millions of us will live forever wondering what might have been.